The History of Sauris, German-Speaking Community in the Eastern Alps. The town of Sauris (Zahre in German; portrayed above with the background of Monte Bivera, 2,474 m) is situated in the high Lumiei valley, at the north-western edge of the province of Udine, near the border with Veneto and the Cadore area. In recent years, this small community has managed to set up two exhibition centres – an Ethnographic centre (pictured below) and an Historical centre – where the fascinating history of Sauris and of its people is being studied and told. According to local tales, the community of Sauris-Zahre was founded by two German soldiers who, tired of war, fled their homeland and found refuge in this isolated and nearly-inaccessible valley. At first they sustained themselves by hunting, then by farming and breeding, clearing and tilling the land. Like all legends, this one has also some truth to it: the first inhabitants came from the valleys of Eastern Tyrol or Kärnten (now in Austria) around mid-13th century. The oldest known document is dated 1280 and quotes, among the possessions of Awardo, lord of Socchieve, a flight of falcons and hawks “in the land of Sauris”, thus proving the existence of a hawking community within the valley at that time. Other documents of the period prove that there were two villages: Sauris di Sotto (‘Lower’ – Dörf in German) and Sauris di Sopra (‘Upper’ – Plozn), with the churches of Sant'Osvaldo (St. Oswald) and San Lorenzo (St. Lawrence) respectively. Unfortunately, a fire broke out in 1758 and destroyed the presbytery in Upper Sauris and all that was contained therein, amongst which there might have been some documents concerning the origins of the community. 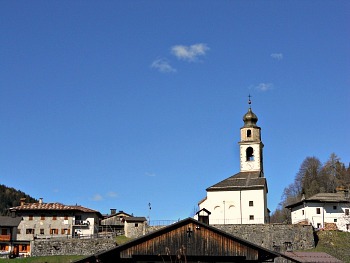 The foundation of Sauris is part of a process of colonization of the Alpine valleys by German-speaking people – a migration that in the Middle Ages involved also other Italian regions (Walser settlements in the Valle d’Aosta and Piedmont; Cimbrian settlements in Veneto; the ‘Mocheni’ in Trentino). Located at the north-eastern tip of Italy, Sauris-Zahre forms a more or less homogeneous group with Sappada-Plodn in the province of Belluno and Timau-Tischlbong – the last village of Carnia before the border with Austria. For over seven centuries the people of Sauris have lived in symbiosis with their environment, carrying out typical Alpine agricultural activities. The resources of the land allowed for a relatively autonomous economy to develop: the woodlands of the valley provided raw material for building houses, stables and barns, carts, working and agricultural tools and implements. Upland meadows were scythed to the top; hay from nearby meadows was taken directly to the barns, while hay from meadows farther away was stored temporarily in small sheds and carried down to the village by sleigh in autumn. During the summer months, cattle were brought to rich high-altitude mountain grasslands for the traditional summer pasture practice (known as ‘alpeggio’ in Italian). For some weeks before, cattle were allowed to first pasture freely in the meadows near the towns and then in those half-way up the mountains, where the families also moved for some weeks, living in barns with an attached habitable dwelling called ‘stavolo’. 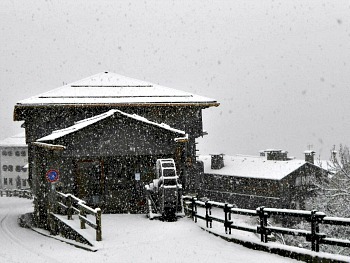 The same procedure was followed upon returning at the end of the summer, if the weather conditions allowed it. 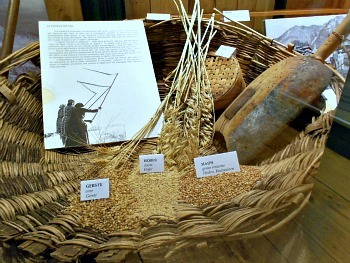 For farming purposes, only a few crops – resistant to a cold climate and with a short ripening time – were privileged and could be cultivated with success: barley, oats, buckwheat, rye, turnip, cabbage and broad beans were grown in the fields near the village together with linen and hemp, which along with sheep wool were spun and woven locally (see a display of the different grains above). In autumn and winter – when they were free from farming and herding duties – the people of Sauris would travel to nearby towns by cart, sleigh or on foot, to barter their products for the foodstuffs they could not get locally (wheat and corn, fruits and the salt needed for preserving food). In 1420 the whole of Friuli fell under the dominion of the Republic of Venice; from then onwards, the forests of Sauris were also extensively exploited for the benefit of the Venetian arsenal, in constant need of timber for the Navy. At that time, wood clearing, transportation and carpentry activities provided job opportunities, attracting labour also from elsewhere. In this way, new residents were added to the original families – evidence of which can be found in the presence of surnames not of German provenance. A further occasion for external contacts was the practice of seasonal migration: to supplement the meager family income, in the last few centuries men would leave town from autumn to spring, returning only for the summer farming and herding work in the high pastures. They moved seasonally to the plains of Friuli and Veneto to work as weavers and tailors, to Austria as woodsmen and carpenters, or to Germany, Switzerland and France as masons. For centuries, communication with nearby valleys was possible only along high mountain passes, through paths and mule tracks. One of the most travelled routes went over Passo Pura (1,417 m) and reached Ampezzo – the nearest bigger town, and hub of the cattle market. In the 19th century, the possibility of building a more direct link along the Lumiei gorge was taken into consideration; however, work did not begin until well into the 20th century, and lasted from 1919 to 1934. An exceptional feat of engineering was the building of a single-arch bridge over the Lumiei river – a 105-metre high reinforced concrete structure. Between 1941 and 1948, Sauris saw another great work: the building of the Lumiei hydro-electric plant with its majestic 136-metre high dam, at the time the highest in Italy and one of the highest in Europe. Due to lack of local workers (who had been drafted to war), 300 war prisoners from New Zealand were used as workforce from spring to autumn 1943; 21 of them died during construction works. 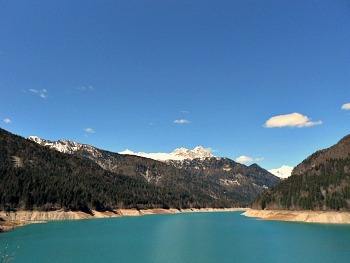 The result of these great works is the wide Lago di Sauris (Sauris lake), nowadays certainly one of the main attractions in the area (pictured below). The buildings of La Maina (‘Ame Lataise’ in the local language), which were submerged by the creation of the artificial basin, were rebuilt higher up, but the ruins of the old hamlet reappear periodically when the level of water in the lake falls. The idiom spoken in Sauris, along with Italian and Friulano (the language of Friuli), is a Southern Bavarian dialect which shows remarkable affinities with other Austrian dialects of Kärnten and Tyrol. If on the one hand the language of Sauris (‘De zahrar sproche’) has been influenced by contact with neighbouring populations speaking Romance languages, on the other hand it has preserved many archaic characteristics of 12th century German, as it was spoken at the time of the founding of the community. For this reason, Italian and German scholars alike have been studying the local language for over a century now. It is thanks to their linguistic studies that it has been possible to determine quite accurately the origin of the first settlers and the period of colonization. For centuries, the language of Sauris was only spoken; its written record begins in the mid-19th century, and it shows a remarkable wealth of poetry production that lives on to this day. As with other 'linguistic islands', the sixties marked the beginning of a downward trend in the use of local language, especially among the younger generations. However, in recent decades, there has been a renewed appraisal of the community’s roots and sense of identity, thus engendering many instances of reintroduction and enhancement of the local culture and language. There is a parish bulletin, ‘De zahre reidet’ (“Sauris speaks”), which has been published for the past thirty years, which often contains articles about the history and the cultural peculiarities of the community. The ‘Zahre choir’ was born more or less at the same time, and it has had the merit of not only safeguarding the performance of traditional songs (especially those sung at Christmas time during the "Canti della Stella" – the ‘Tour of the Star’, with the so-called “Star Carols”; read below), but also of enhancing the composition and singing of modern musical themes with lyrics in the language of Sauris. For the past fifteen years, the language and customs of Sauris have been subjects regularly taught in the local schools, thanks also to state support and to the recent laws in defence of linguistic minorities. The Sauris Ethnographic centre (‘S haus van der Zahre’) is housed in a wood and stone building which is a significant example of local architecture. Erected in Sauris di Sopra in a shed originally used as stable and barn, it is a very good example of Alpine architecture, designed to exploit as best as possible sunshine and ventilation, and in order to guarantee internal warming in the stone quarters during the winter – as well as the stratified and differentiated storage of fodder in the upper part – and finally to bear the great weight of the snow thanks to the elastic properties of the wooden frame (in the picture above, a winter image of the building hosting the Ethnographic centre). The recovery works, despite modifying the final destination of the rooms, have maintained and respected the typical architectural and environmental characteristics of the building. 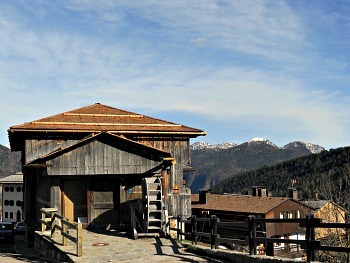 The restoration aimed at preserving the external walls of joint larch logs and wooden pegs (a bulding technique of German origin known as 'Blockbau'), the floors made of larch and pine boards, the inner crescent-shaped balconies with balustrades for drying grains and hay, and the internal wooden pillars and beams supporting the roof, covered with larch shingles (‘scandole’). The boarded walls of the second floor have ‘eyes’ with sliding doors, used to regulate the amount of ventilation inside the building according to different weather conditions outside, so to ensure the best possible environment for the preservation of fodder. As anticipated earlier, the four-faceted roof is covered with larch shingles (called 'scandole' in Italian); even the wooden eaves have been restored. All the new elements that have been introduced because of the changed destination of the building (stairs, banisters, frames, supporting beams, etc.) 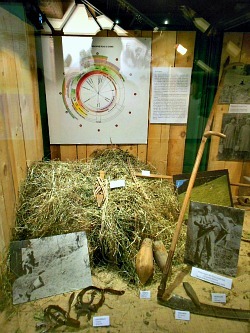 are made of green varnished metal, so to highlight the new function (another image of the Ethnographic centre's interior is below, with the display on agricultural works). The basement (former cowshed) now houses a conference hall, used also for meetings and cultural events, while the exhibition rooms are on the two upper floors. The mission of the Ethnographic Centre is to document the cultural uniqueness of the Sauris community and to inform about its various aspects by way of temporary exhibitions. It is therefore not a mere container of objects, but rather a place for research, where local cultural activities and interests meet and mediate with external scholars and institutions. The local community is also involved in research activity by collecting oral reports of memories, through lending objects and collaborating in the realization of exhibitions and the publication of books. Equally important is the relationship with the academic world, based on educational laboratories and collaboration with local schools. So far, the Ethnographic Centre has signed exhibitions and publications dealing with the following subjects: the Carnival of Sauris; summer pastures and haymaking; local architecture; dress; carpentry and smithy works; the work of 16th century sculptor Michael Parth (his are the two wooden altars in the churches at Sauris di Sotto and Sauris di Sopra); folk devotion; the history of the forests in Friuli; paths, roads and communication; water as a source of life and energy; dietary culture and, finally, Sauris as perceived through the eyes of painters. 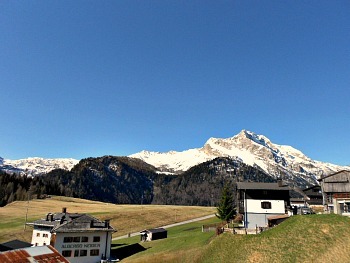 Because of the difficulty of getting there, the roughness of the land and the presence of a German-speaking population, the outside world has helped to keep alive the myth of Sauris as an isolated community whose environment, language and customs have allegedly remained intact over the centuries. But history teaches that such ‘islands’ do not really exist: documents and studies have clearly proven that the people of Sauris opened paths where there were none; crossed over passes and mountains, and established relations with neighbouring populations, bartering their produce with them, while learning their language and watching their customs. Many of the traditions of the people of Sauris are the result of a fascinating synthesis of different cultures, particularly the German and the Carnian – cultures that contributed to the development of the singular identity of this community. Besides certain facets and elements pertaining to the material culture (such as architectural types, cooking and preservation of foodstuff, agricultural tools and techniques, style of attire and clothing in use until a few decades ago), the most appealing and vital traditions have been kept in the religious and symbolic fields. The collection of auspicious alms takes place in the period between Christmas and Epiphany each year. Children and adults alike tour the villages on different days, bearing a bright, colourful star with them and chanting traditional Christmas carols in ancient German, Italian and Latin. On the morning of New Year’s Day the children run down the streets, going from one house to the next, singing a rhyme of good wishes in the language of Sauris, and receiving in exchange sweets and dried fruits. In the past, this was done also on December 28th – day of the Holy Innocents – while singing a different rhyme, but now this tradition has died down. Following a period of neglect, the rituals of carnival have been reintroduced with some inevitable changes. The masqueraders, divided into ‘pretty ones’ and ‘ugly ones’, don old clothes and little hats, decorated with paper flowers and coloured ribbons, and wear a wooden mask (for whose production Sauris was – and still is – famous), a veil, or simply soot on their faces. Other typical characters in the carnival of Sauris are the Rölar and the Kheirar. At the call of the Rölar, with his large belt of noisy jingles (Röln), the masqueraders assemble and tour the village, following the Kheirar and the musicians. In the past the Kheirar, armed with a big stable broom, would enter the homes, inviting couples of masqueraders to come in and dance, while he swept the floor between the exit of one couple and entry of the next, symbolically sweeping away winter and all negative forces, while making room for spring and all things new. During the Holy Week children run up and down the streets shaking their noisy rattles; the loud noise of these instruments makes up for the silence of the bells as Passion approaches and is being commemorated inside the churches. The ritual of Holy Friday in Sauris di Sopra – where the cross and the symbols of Passion are taken in procession – is particularly moving. Each hamlet also celebrates its Patron Saint, as well as some Marian holidays. On these occasions – and on some other religious festivities – ritual blessings are performed (on water, salt and fruit at Epiphany, on bread at Easter, and on the Holy Bouquet on the Virgin’s Nativity day). The pilgrimage to the Sanctuary of Maria Luggau in Kärnten (Austria) takes place each year in September; this firm ancient tradition was abandoned at the beginning of the 20th century, but it was reintroduced a few decades ago, and it is now very felt again by the population. In fact, a Faith's Trail ('Sentiero della Fede') has been set up, connecting high-altitude paths between the two sanctuaries of Sant'Osvaldo (St. Oswald) in Sauris di Sotto and Maria Luggau. 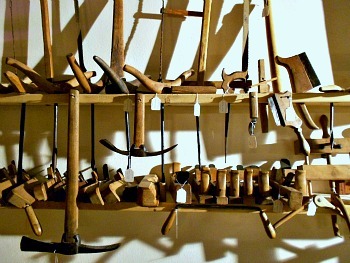 The exhibitions organized by the Etnhographic Centre and the objects on display – nearly all of them manufactured locally – bear witness to the fact that in the past the need to be self-sufficient forced the people of Sauris to contrive ways to manufacture their implements of daily use locally. Along with the primary activities of farming and animal breeding, woodcarving and carpentry were also practiced mostly by men, who devoted the winter months to such activities and to manufacturing and repairing implements and tools. The most experienced among them used maple or alder wood to make objects requiring carving skills, such as the ‘dalmine’ (wooden clogs) and the renowned carnival masks. A higher still level of expertise was required for the work of the ironsmiths, weavers and tailors. Each hamlet had its own forge, where the smiths would craft the metal parts of tools and of means of transportation (carts, sleighs); these craftsmen worked as farriers too. Up until the beginning of the 20th century, there were also several hydraulic plants functioning in Sauris, activating mills, sawmills, cableways powered by the watercourses of the valley. 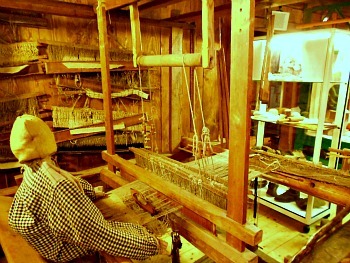 A 19th century loom (pictured above) and some tools used for working wool and fibres are exhibited in the small hall at the Ethnographic Centre. Clothing and garments were wholly manufactured in the valley. During the winter, women would card and prepare the yarns (with locally-grown flax, hemp seeds and wool). Weaving was traditionally a male activity: between the 17th and the 19th centuries, many were the young men who learned the art of weaving in the plains of Friuli; some stayed on in those areas, opening their own workshop and returning to the village in summer only, to help out with the farm works. Others decided to practice their trade in Sauris instead, manufacturing cloths that were then entrusted to the skilled hands of tailors (for men’s wear) or of women (for ladies’ and children’s wear). The weavers manufacturing in Sauris were active until the mid-20th century. The traditional outfit consists of well-made items which are simple in style, functional and durable, as required by the harsh Alpine climate and a life of hard work and toil. People usually had only two sets of clothes: one for everyday use and the other for festive occasions. The female outfit consisted of a close-fitting, sleeveless bodice attached to a long skirt, thickly-pleated especially at the back, so that it could be lifted easily and stitched to the waist to keep it out of the way during work. A short, tight-fitting jacket with wrist-length sleeves completed the outfit. The colours of the dress and jacket were mainly dark (black, brown, green, grey, crimson red). A white shirt in linen, mixed linen-hemp or cotton was worn under the dress. It was knee-length, with short lateral slits and wide sleeves pleated at the shoulder. Yoke, neck and cuffs were often embellished with lace; the yoke was sometimes also embroidered, often with one’s initials. The daytime shirt was also used as a nightgown; to protect the dress, women wore an apron made of wool or mixed wool-hemp fabric for work in the fields or in the stable, or made of cotton for household chores and holidays instead. A woman’s head was always covered by a wool or cotton fringed head-square: folded in the shape of a triangle and then folded back again for two or three centimeters, it was knotted at the back, on the nape or at ear level; the corners were knotted again at the top of the head. Brightly-coloured head-squares were preferred for festive occasions: especially on holidays and when not wearing a jacket, a small woolen or cotton crotched scarf was worn around the neck, usually black with a strip of contrasting colour (blue, green, red or violet). The female attire was completed by small jewellery such as gold earrings or necklaces with many strands of glass beads, very popular in Sauris. Equally functional and even more staid was the male attire: men, too, wore a long cotton or mixed linen-cotton or linen-wool shirt with a stand-up collar, usually coloured (chequered or striped) or white. A waistcoat went over the shirt, short at the waist, with a rounded or ‘V-shaped’ neckline and breast-pockets. The garment was made by tailors, using woolen material. The coat was quite close-fitting and more often single than double-breasted. The trousers could be straight-legged down to ankle length or large, calf-length plus-fours. As with ladies’ garments, dark colours were preferred. In cold weather, men also wore longer and heavier coats or a woolen cloak, often hooded. Knee socks and socks were knitted by women using light-coloured yarn for the foot portion and dark-couloured yarn for the leg portion. Men also wore either a hat with a not very large brim or a cap. Footwear was basically of two types: wooden clogs or ‘scarpetti’ (light shoes) with black velvet vamp and a white sole. Shoes were quite rare; they were worn mainly by men who had to leave on business, and so had to walk a lot and also be ‘presentable’ upon arrival at destination. The scarcity of agricultural produce, due to the harsh climate and the geological characteristics of the land, has long conditioned the dietary habits of the local population. The resulting cuisine is based on few dishes, poor as to ingredients but substantial and appropriate for the heavy work and hectic pace that the people of Sauris were subject to during several months of the year. Housewives could rely on some ‘minor’ grains (barley, rye, buckwheat); milk and its by-products; the meat of domestic animals; game; wild herbs and the few products of the vegetable garden (turnip, cabbage, broad beans). Broad beans in particular are resistant to cold weather and can be grown at high altitudes too. They were probably brought to Sauris by the early settlers, and used in everyday cooking in place of normal beans; they were also used as exchange goods when bartering with other towns. The importance of broad beans in the dietary habits of the people of Sauris can be measured by the frequency with which they occur in proverbs, singing rhymes, sayings and by the presence of special dryers (akin to the German 'Harfe') in some early 20th century photographs, unfortunately now all disappeared. Cabbage was also a very important crop: it could be eaten fresh, but it could also be preserved by fermentation, so to obtain a final product – similar to Sauerkraut – which could be consumed during the winter months, or bartered for beans and fruit. Turnips (traditionally used to make 'brovada', a staple food of Friuli obtained by fermentation of the sliced turnips in dregs of pressed grape – a by-product of wine) were gradually replaced by potatoes. Potatoes were introduced in Sauris at the beginning of the 19th century with very good results; they soon became 'number one' staple food for most mountain populations – and Sauris was certainly no exception. The production of dairy products was also significant, and still to this day historical dairy farmsteads (known as 'malghe') dot the surrounding mountains, linked in sequence by a series of paths, trails and muletracks that collectively form the 'Via delle Malghe' (the "Trail of the Malghe") network. The proceeds of marketable high-quality dairy products were used to buy imported goods: wheat, corn, fruit, spices and especially salt, indispensable for human and animal consumption and for the preservation of several foodstuffs. For this reason, butter and cheese were consumed only on very special occasions (hard work, illness, birth, weddings, funerals and important holidays). A special kind of pickled cheese was eaten instead quite frequently. ‘Ricotta’ cheese was also eaten daily, preserved by smoking or fermentation. The smoking techniques – used mainly to preserve meat – were probably introduced by the first colonizers in time, and the people of Sauris became masters at these techniques. Among the meats of domestic animals, sheep and pork meats were the ones most commonly consumed. Pigs in particular guaranteed the survival of the family, providing it with lard, bacon, sausages, blood-pudding and cooking fat. Today, more than anything, Sauris has become synonym for ham – even though in the past this delicacy only rarely reached the table of the people who produced it, being ham largely reserved for the market as a luxury item and precious source of income. Fulgenzio Schneider (1864-1941) was born in Sauris, where he spent most of his life; he started to carry out many trades at an early age to help his family, who was in dire straits because of a serious illness that had disabled his father. For this reason he could not attend seminary, thus interrupting a family tradition. In the 19th century, in fact, many families from Sauris underwent great expenditure and sacrifice so that at least one family member could enter upon an ecclesiastical career. Evidence of this lies in the fact that during that very century, at least 25 priests came from a single community! Some of them later helped their nephews to enter upon the same career, thus giving rise to genuine ‘dynasties’ of parish priests. In Fulgenzio’s family alone, for instance, his father, grandfather and great grandfather each had a brother who was a priest. His mother’s brother – called Rev. Lucchini, a highly educated man, professor at the archiepiscopal seminary of Udine and later to become a missionary – was the author of a book about St. Oswald’s Sanctuary in Sauris di Sotto (1880) and of an essay on the Language of Sauris (1882), which are the first scholarly studies on such subjects (local language and the origins of the community). After completing his third year in elementary school, Fulgenzio started working on the farm, in the woods, in the stables – wherever needed – learning also how to become a carpenter and how to make the ‘dalmine’ (see above); in the meantime, he continued his education on his own. He was later one of the founders of the local consumers’ Co-op ('Cooperativa di Consumo di Sauris'), and its book-keeper for eleven years. He had a large family, but his life was afflicted by many deaths and accidents. He was a man of great moral standing and staunch faith – a genuine figure of ‘common intellectual’. Between 1911 and 1941 Fulgenzio wrote a series of notes containing personal considerations, poems, family stories, local customs and legends, important events and changes taking place within the community of his time – thus documenting a very important time in the history of Sauris. At the Etnhographic Centre there is a space especially dedicated to him, where his carpenter’s bench with its many tools and a small family altar decorated by his daughters are both on display (see the image above). In Sauris every hamlet – no matter how small – has its own church, some of which house real treasures of art. A 1328 document mentions the existence of a sacred building in Sauris di Sotto dedicated to Sant'Osvaldo (St. Oswald; pictured above), whose worship was probably introduced by the early settlers. It may be that they also brought along with them a holy relic, St. Oswald’s thumb. Worship of this saint was very popular in southern Germany and in the Alpine region during the Middle Ages and after. St. Oswald, king of Northumbria – a region of Northern England – lived in the 7th century and died in battle; perhaps for this reason, he was invoked as a healer and a protector against the plague and epidemics in general. 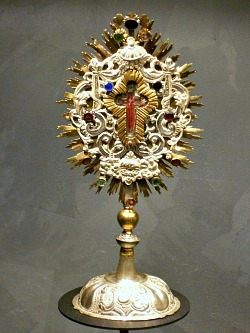 Thanks to the presence of the precious relic – deemed responsible for many prodigious recoveries – the sanctuary in Sauris became one of the most famous devotional centres within the Republic of Venice: from the 16th to the 19th century, the sanctuary became the destination of hundreds of pilgrims coming from Friuli, Cadore and other cities of Veneto, especially Venice. The building was enlarged and adapted many times over the centuries to lodge the pilgrims; the present structure dates back to the 17th century. The bell tower, with its onion-shaped steeple, is characteristic, and certainly owes a lot to the German background of the community. Some grave stones are embedded into the southern wall of the building, in remembrance of the old graveyard that used to be where today’s church parvis is. The rectangular main body of the church’s interior is divided into three aisles by tufa pillars and arches. 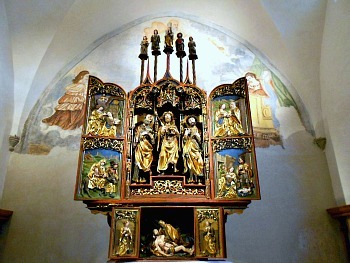 In the presbytery stands a beautiful Flügelaltar – a typical German altar with opening doors – crafted by Michael Parth from Brunico/Brüneck (present-day South Tyrol) in 1524. 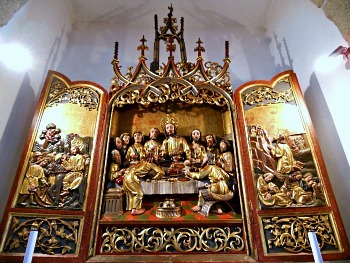 This altar – made of carved, gilded and painted wood – is a typical example of the late German Gothic style: St. Oswald stands in the centre, with St. Peter and St. Paul at his sides, while a vivid ‘Pietà’ (image of piety) is on the underlying ‘predella’ (base). The doors are carved in bas-relief with scenes of the life of the Virgin and Jesus (on the inside) and some saints (on the outside). On the crown, among steeples and spires, are the Madonna and Child with angels and saints (see an image of the open Flügelaltar below). At the end of the right-hand aisle is another altar dedicated to St. Oswald, made by Gian Francesco Comuzzo from Gemona in 1658, on which are pinned a number of votive offerings (silver hands and arms). Midway down the left-hand aisle is the altar of the Madonna of the Belt (‘Madonna della Cintura’ – 17th century; altar piece of the 18th century), whose worship was so popular that in 1725 the Confraternity of the Belt was founded. Its name comes from the fact that every year its members received a blessed belt that was supposed to protect them from all sorts of evils. Another altar, dedicated to San Silvestro (St. Sylvester; 17th century), stands at the far end of the left-hand aisle. The ceiling is decorated with plain frescoes depicting the Death of St. Oswald and the Assumption of the Virgin. The processional banners, with silver plaques portraying St. Oswald and the Madonna of the Belt (of Venetian manufacture; 18th century), rest against two pillars. The 1328 document also mentions a building for the worship of San Lorenzo (St. Lawrence), in Sauris di Sopra. Erected on a slope not far from the village, the existing building dates back to the 16th century and is a typical example of a small Alpine church in German Gothic style. The polygonal apse, with its three lancet windows, and the bell tower with its polygonal steeple are definitely remarkable. The graveyard spreads out around the church and onto the slope facing south. Inside, the imposing wooden trusses – restored after the 1976 earthquake – enhance the verticality and brightness of the interior. Along the walls there are four oval medallions portraying the Evangelists, salvaged from the false ceiling when it was demolished during renovation works. There are also paintings of the Way of the Cross with wordings in German, thus proving that German was being used locally also in religious practices. 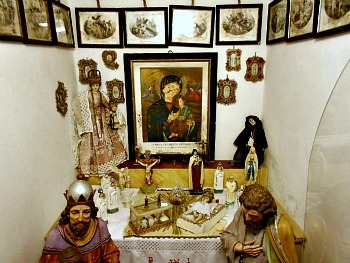 The church houses two other noteworthy wooden altars: the altar of the Madonna del Rosario (Madonna of the Rosary), along the left-hand wall, has been badly damaged by thieves that have deprived it of all its original statues. This altar was also made around 1650 by the same Gian Francesco Comuzzo quoted above. On a shelf near the altar stands the wooden statue of the Madonna of the Rosary; it is one of the dressed Madonnas of Sauris; this type of statue was very popular with the lower classes until the beginning of the 19th century, when the official church contested this style. The Flügelaltar of the Last Supper, crafted in Michael Parth’s workshop in Brunico/Brüneck, stands in a recess on the wall to the right. The coffer and the doors are vividly decorated with three Eucharistic scenes: the Last Supper, Jesus entering Jerusalem and the Prayer in the Garden of Gethsemane. The biblical episode of the Manna and the Brazen Serpent is depicted in the ‘predella’ (base). The altar is completed by a crown of spires made in a typically German Gothic style. During the Holy Week the doors are being kept closed, and it is an occasion to admire the external decorations: an exquisite Annunciation scene is painted on one door. The artist’s initials (M.P.) and the date, 1551, can be seen in three different points on the altar (which is pictured, open, below). The Confraternity of the Holy Sacrament commissioned the altar to the same Brunico/Brüneck workshop where, almost thirty years before, the main altar of St. Oswald’s church in Sauris di Sotto had been crafted. Compared to the latter, however, the altar at Sauris di Sopra shows not only the Late Gothic style that was typical of this workshop, but also an increased influence of the Italian Renaissance Art, particularly evident in the central scene and in the perspective of its chequered floor. A large arch joins the aisle to the polygonal apse, which is typically Gothic in style and covered by a beautiful ribbed dome vault. Quite remarkable are also the small church of the Holy Trinity at Lateis – built in 1674 following a vow made by the local community to ward off an epidemic of cattle plague – and the even tinier church of San Giuseppe (St. Joseph) at La Maina, rebuilt uphill when the artificial basin was created in the early 20th century, submerging the old hamlet. Inside, a small plaque commemorates the workers who died during the construction of the dam. Other marks of the profound religious feeling of the people are scattered around the community, certainly within the two hamlets of Sauris di Sotto and Sauris di Sopra (votive frescoes; small chapels), but the so-called ‘Signs of the Sacred’ are in fact dotted over the whole territory of Sauris, where crosses, small wooden shrines and holy images appear – especially along the highland paths and at the crossroads – in particular as a way to ward off dangers when cattle were taken up and down the mountain pastures at different times of the year (see picture below). The Historic Centre, housed in the rectory in Sauris di Sotto, was conceived as a centre of documentation on the history of the community – in particular the events connected to the worship of Sant'Osvaldo (St. Oswald) and the sanctuary named after him. Born in 604 AD, Oswald was king of Northumberland, a region in Northern England, and with the help of Bishop Aidano he evangelized his subjects. He was humble and generous, especially towards the poor. He died in the battle of Maserfield in 642AD, killed by the Pagan king Penda. Oswald’s virtues and his violent death increased his fame of saintliness, giving rise to many legends. In the venerable Bede’s 8th century ‘Historia Ecclesiastica gentis Anglorum’, it is written that Oswald’s intercession freed the monastery of Selsey, Sussex, from an epidemic of plague. Many new elements were added to Bede’s tale during the Middle Ages. In a 12th century manuscript, Oswald takes on the ideal characteristics of a medieval knight: beauty, physical vigour, heroism, staunch faith. He also acquires the traits of a savior king: considering his own sins to be the cause of an epidemic that smote his kingdom and himself, he recovered through his prayers, and forced the disease to abate. Oswald’s vicissitudes became legendary also in tales developed in German-speaking countries. In a 15th century poem, Oswald is depicted as the hero who manages to win and marry the daughter of a Pagan king with the help of a talking crow who delivers to the princess Oswald’s messages and his engagement ring. In this and in other tales we can trace the iconographic origin of St. Oswald, as we see it represented in Sauris and in all the other places where the saint is worshipped. This is evident, for instance, in the processional statue and in Gian Francesco Comuzzo’s altarpiece in Sauris di Sotto: here, St. Oswald is wearing the soldier’s cuirass (to remember his martyrdom) and the Royal insigna – crown, scepter and purple mantle. But what makes the saint unmistakable – from an iconographic point of view – is undoubtedly the black crow perched on his left hand, with a golden ring in its beak. In the museum, many photographic reproductions narrate the Saint’s iconographic evolution in Northern Italy and in German-speaking countries, and a map shows the distribution of his worship throughout Europe. As already mentioned, the sanctuary of St. Oswald in Sauris di Sotto became an important centre of devotion for the Friuli and Veneto regions; the exhibition illustrates certain aspects and phases of such devotion. In the first show-case, 15th and 16th century parchments from the Parish archives testify to the consecration of churches in Sauris, the concession of indulgence to visitors and the ratification of popular patronage – i.e. the right of the community to elect their own parish priest, exercised in Sauris until the 1970s. A few enlargements of documents reproduce 18th century maps of the territory of Sauris – especially of the woodlands that were so important to the Republic of Venice, of which Sauris was part for several centuries. In order to understand how the valley would have looked like to pilgrims arriving from the plains, the travel journal of a gentleman from Portogruaro (near Venice) is quite revealing. In August 1683, he described his arrival in Sauris as follows: “That village situated amidst mountains is always shivering with cold: it seems that winter has its permanent abode there. Only in May does the soil warm up, and that’s when seeds, rye and broad beans are sown. Upon our arrival, the wheat was as green as the broad beans, the rye had been harvested, but it was guarded against bears, who feed on it”. Other show-cases are dedicated to silverware and sacred vestments: many of these objects are votive offerings, donated especially by the Venetians. A beautiful set of astylar crosses, ciboria, chalices, reliquaries, and silver chandeliers testify to the devotion of Venetian goldsmiths, whose guild had chosen St. Oswald as their patron and protector (see an example of such works above). A pair of chandeliers, in particular, bears the name of the donor (Ser Andrea da Mulla) and the date (1726). The 17th century lantern-shaped reliquary that holds the famous relic of St. Oswald is also of Venetian manufacture. A gilt-copper 15th century reliquary with white and blue enamel work that was made either in a Friuli or Veneto workshop, influenced in style by the works of a famous goldsmith from Udine (Niccolò Lionello), is probably the most precious item contained in the museum. The presence among these objects of two ostensoria and a reliquary clearly of German manufacture proves that among the pilgrims there were also some ‘cramârs’ – street vendors from Carnia who travelled on foot to faraway countries beyond the Alps. The sacred vestments cover a time span from the 17th to the 19th century, and document the evolution of tastes in decoration style. They come from factories in Friuli, Veneto and France, and are evidence of the main weaving and embroidery techniques: brocatel, lampas, damask, satin. Also, the vestments can sometimes be traced back to their donors – as in the case of the chasuble donated ‘by devoted Venetians in the year 1750’, or of another bearing the papal emblem and the symbol of the Dominican order (a dog with a torch in his mouth), which belonged to Pope Benedict XIII and was donated by his successor, Benedict XIV, after Cardinal Comucio had been to Rome to invoke plenary indulgence for the pilgrims going to Sauris. Other votive offerings are evidence of a devotion that may have been ‘poor’ in materials and for size of objects, but certainly no less fervent – such as the curious ‘anatomical’ offerings (arms, legs) or the small paintings on wood ('ex-voto' in Italian). Quite unusual are also two 17th century paintings depicting episodes in the life of St. Oswald; these are examples of ‘open offerings’, as they leave an unpainted strip of canvas at the bottom, at the disposal of pilgrims who might want to insert a dedication. 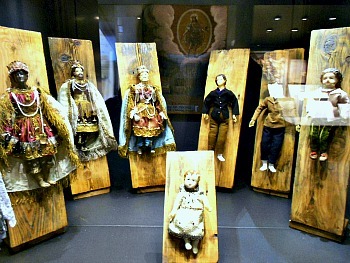 An unusual 18th century crèche in wax and fabric completes the exhibition (see a picture of it below). A document of 1328 attests to the existence, in Sauris di Sotto, of a sacred building dedicated to St. Oswald, whose cult was probably brought here by the first inhabitants of the valley, coming from nearby Kärnten (Austria). Perhaps, they also carried a holy relic with them — a thumb. The cult of this saint had particular fortune in southern Germany and the Alpine countries starting from the Middle Ages. Born in 604, Oswald was king of Northumberland, a region of northeastern England. With the help of Bishop Aidan, he evangelized his people. He was humble and generous, especially with the poor. He died in battle at Masefield on August 5th, 642, killed by the Pagan king Penda. The virtues of Oswald, together with his violent death, fed his reputation of sanctity, giving origin to numerous legends. In Historia ecclesiastica gentis Anglorum, compiled by the venerable Bede in the 8th C, it is narrated that Oswald’s intercession would have freed by a plague epidemics the monastery of Sesley, in Surrey. During the course of the Middle Ages, Bede’s account was enriched by new elements. The figure of Oswald acquired the ideal features of a Medieval knight: beauty, physical vigour, heroism, solid faith. Other legendary traits can be traced in the accounts that have further developed in Germanic countries. Oswald is the hero that manages to conquer and marry the daughter of a Pagan king with the help of a talking raven, which delivers the princess his messages, together with the engagement ring. From various other written sources, the iconography of St. Oswald is derived, very similar to what can be appreciated in Sauris and other locations in Northern Italy where his cult is still present: St. Oswald dons a soldier’s armor, which reminds of his martyrdom, and the regal insignia (crown, scepter, red mantle). But the attribute that makes the saint unmistakable is definitely the raven, carrying a golden ring in its beak. The figure of St. Oswald was invoked mostly as a miracle-maker (in fact, he was a shaman); as protector against the plague, and epidemics in general — so his figure is connected to healing. Thanks to the presence of the precious relic, through which miraculous healing were occurring, the sanctuary in Sauris became one of the foremost devotional centers in the Republic of Venice. From the 16th to the 19th C, it was the destination of hundreds of pilgrims coming from all over Friuli, Cadore, other cities of the Veneto — and in particular Venice, as it is testified by the numerous graffiti on the walls of the church, as well as the ex-voto kept in the Historiographic Museum (Museo Storiografico). As a matter of fact, the cult of Oswald spread far and wide around a region centered in the eastern Alps: in many areas of current Bavaria, Tyrol, Veneto, Friuli, Kärnten and western Slovenia, the cult is still very much alive to this day. One can perhaps rightly say that the village of Sauris — in the mountains of Carnia, Friuli, at the border with Veneto and not far from Austria — is at the epicenter of such cult. St. Oswald's day is August 5th, the day of his death. 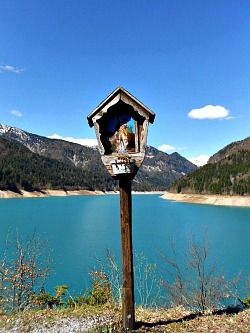 (Below, a picture of the capital dedicated to St. Oswald along the lake of Sauris).